A group of Otzma Yehudit activists, led by former MK Dr. Michael Ben-Ari, Attorney Itamar Ben-Gvir and coordinator Yossi Davidov, arrived on Tuesday night to the home of leftist actor Oded Kotler in a symbolic and comical protest. Kotler raised a storm at an artists rally on Sunday when he called Likud voters, "straw-chewing beasts," saying the ruling party is "followed by a marching herd of beasts chewing straw and stubble." In response, Ben-Ari, Ben-Gvir and the other activists brought a bale of hay and straw to Kotler's home, placing it at the entrance while exchanging words with the actor's neighbors and explaining that Kotler's insult was directed against all nationalists and not just the Likud party. "We came here today to expose the hypocrisy and the arrogance of Kotler, (Yair) Garbuz and their friends who are sure that they are the masters of culture and everyone else are beasts," said Ben-Ari, in a reference to the poet Garbuz who possibly lost Labor the elections by slamming "mezuzah kisser" right-wingers at a leftist rally. Ben-Gvir stated that despite the pretensions of tolerance by Kotler and other leftist liberals, he in fact the racist and not members of the political right. "We came today for an operation of free distribution of hay and straw," Ben-Gvir joked. "While he (Kotler) pretends to be an enlightened person, in fact he's a very primitive man. We will continue to expose the hypocrisy of the left." 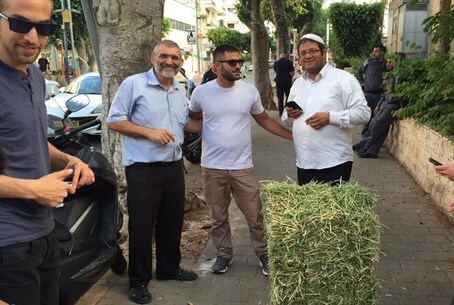 As they were bringing the straw to Kotler's door, the Otzma Yehudit activists joked that it was kosher, fresh and still hadn't even dried out yet. Waiting in front of the house, as Kotler unsurprisingly did not come out and partake in the choice hay and straw, they invited passersby to have some "on the tab of the Kotler family." Video from the comical protest, in Hebrew, can be seen below.